The Crow and the Powderpuff | A Creative Makeup & Beauty Blog: *****Closed***** January Giveaway! 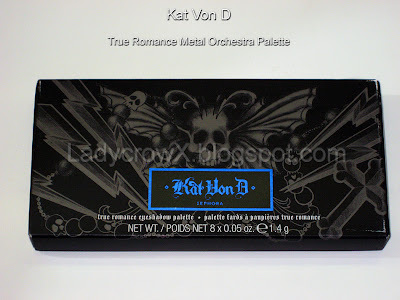 January's giveaway is going to be the Kat Von D Metal Orchestra Palette, this was a Limited Edition Palette and is getting tough to find from what I can tell. The Giveaway will start today January 23rd, 2012 and go until February 23th, 2012 at 11:59pm EST. One entry form per person!!! If you mess up then send me a tweet or e-mail asking me to delete the old form. My favorite foundation is the Loreal True Match foundation but I think it has started oxidizing on me so I'm on the hunt again! My favourite foundation is the L'Oreal Matte Morphose Mousse foundation, although I think it's called Magic Souffle or something in the states. It's the same thing. I do not have a favorite foundation, in fact, recently all I have been using is the Aveeno Tinted Moisturizer in Fair to Light as it gives me the same amount of coverage all my other foundations did. I actually never use foundation! But I do wear Maybelline Dreammatte powder to even out my skintone and make my face look more matte. Hmm tough one, I have a few but my fav would have to be Revlon ColorStay for normal/dry skin! My favourite foundation is anything Lancome. My favorite foundation is Revlon Colorstay! I love the Revlon foundation. Just like MAC's but much cheaper! I don't have a favorite foundation because I don't use it often enough to keep one. But I love my thebalm balm shelter tinted moisturizer. My favorite foundation is Estee Lauder Double Wear! It is the best I've ever found! My favorite foundation is Dermablend's Cover Creme. I don't have a favorite foundation because I don't use any, it makes me feel like my skin can't breathe! Sooo second best would be Covergirl's tinted moisturizer! My favorite foundation of the moment is Philosophy's super natural mineral foundation! I hardly ever use foundation, but my favorite has been Stila's Flashlight pressed powder. It's pale enough without being yellow (I'm neutral but for some reason manufacturers tend to assume anyone that pale is yellow) and it covers really well. My favorite foundation right now is Covergirl Oil Free in buff beige. My favourite foundation is Revlon Colorstay for Oily/Combination skin! I don't hav favorite foundation since i did not wear foundation. I'm using BB Cream. My Favorite BB Cream is LUVIEW Crystal Cover BB Cream. I love Revlon Colourstay, such a good foundation. I've been using an Inglot cream foundation and finding it has perfect color, tone and coverage for me for a reasonable price. Hi, beautiful giveaway, thank you! My favorite foundation is Revlon Colostay. this is such an amazing giveaway. I cannot find ayway to order Kat von D palettes in Grece and I realy want to try them. I don't generally wear foundation, instead I wear Kiss My Face tinted moisturizer in Manila. It gives nice light coverage and evens my skin out. I don't have a favorite foundation, but I do have a favorite BB cream! It's Lioele Triple the solution. Fav foundation is the Maybellyne NY Dream Matte Mousse! My fav fundation is the elf one!! My favorite foundation a mineral powder foundation in olive by Silk Naturals. I've heard good things about make up forever! Currently the only foundation I own is Revlon Color Stay. I so like it very much but they don't have a color that's right for my skin and I find when my skin is dry it really extenuates the dry spots. I also have trouble building it without it looking cakey. The favorite that I've tried has got to be the sephora tinted moisturizer. Exactly my color, it builds well, and sits beautifully. I'm really wanting to try the Illamasqua skin base. I actually don't use foundation!!! My favorite foundation is anything from Almay, it is gentle for my sensitive skin. I like MAC Studio Fix Powder Plus Foundation. Currently my favorite is bare minerals foundation. I use pure argan oil as a primer/moisturizer. My favourite foundation is revlon colorstay! I'm actually using Kiko's BB cream,it's amazing! My favourite foundation is Revlon colourstay normal/dry in the shade Ivory. My favorite foundation is Cover FX Natural FX in E0! Great coverage! Thanks for this amazing giveaway. It is hard to find a way to order Kat Von D palettes in Italy! My #1 foundation is revlon colorstay foundation, Thank you for this giveaway!! I don't really use fpoundation, but if I do, it's usually Every Day Minerals Soft Butter Peach. My favourite foundation is probably Gosh Velvet Touch Foundation but I must say I rarely ever use foundation. It has light coverage and that's enough for me. I usually just put it on as a concealer because concealers turn cakey on me pretty fast and foundations don't do that on me. Amazing giveaway :) Thank you. My favorite foundation is mac studio. Thanks for the giveaway and a fun blog!! My favorite foundation is by Lancome "Photogenic Lumessence"! My favorite foundation is Sheer Cover. I honestly dont have a favorite foundation. Right now , im just not using one. and I HATE that. my face has quite a bit of reddness , but its super dry.. Every foundation I've used make my face look worse than nothing at all :( Hope i find a HG soon! My favourite foundation since 2004 is MAC Select SPF15. It's waterbased, it's light, and it does what I want and nothing less: smoothens out colour differences and makes your skin seem natural whithout leaving a powdery trace. Together with a mineral powder on top it creates a healthy, seemless look! I don't use it very often, but when i do, that i use Revlon Color Stay. i use covergirl.. the orignal one.. dont remember the name but the 5 dollar one. I love MAC Studio Mist! Currently using Smashbox HD healthy fx foundation. It's awesome and great coverage. i am currently searching for a good one..i think i'm going to cough up thirty dollars and try MAC foundation! however, i kinda like maybelline stay foundation. i just have the wrong color for me! Bourjois Healthy mix is my fav - it's not heavy at all - I hate when you can see I'm wearing foundation from a mile's distance! I would love to win! This is a great giveaway! my favorite foundation is actually a combination of a few. I mix NYX Pale, tarte smooth operator and moisturiser. I love Chanel's Lumenarie (SP?) foundation! I am a huge fan of makeup forever! But when I DO use it I choose: Revlon Age Defying Light Makeup w/Botafirm SPF30.. unfortunately it was Discontinued, so I am lucky I stocked up with coupons & Sales!!! My favourite foundation is Skins79 VIP Gold BB Cream! I use the Maybelline mousse foundation! My fav is Maybelline mousse foundation! I don't use foundation actually but I like to use BB Cream, I use Maybelline's Clear Smooth BB CREAM. My favourite foundation is L'oreal Visible Lift. Favorite foundation is Laura Mercier silk cream foundation. Hi, my favorite is the revlon colorstay, it stays on all day! Beauty Essential: My Favorite Foundation ... Thank you Lauren for telling me about this fantastic product! My favorite foundation has to be by Shiseido...Great for my oily skin super coverage and luminuous face!! My favorite is Revlon Colorstay. It's affordable, it lasts and has great coverage. Thank you. Hi, thanks for the giveaway sweeetie. My fav foundation is face & body of MUFE. My favourite foundation was Xperience Foundation from Max Factor but recently I tried the Estee Lauder's Double Wear and Clinique's Anti-Blemish and it's sooooo hard to choose between them. My fav foundation is Everyday Mienrals foundation :) I love the original glo formula! i dont have a fav . but i use to use cover girl foundation but some times use l'oreal or what i can get my hands on that will work with my skin color. My favorite foundation is Ahava's Light and Rich foundations! My favorite foundation lately is Dermablend of Vichy! thank you for this giveaway, I was thinking about buy a palette from kat von d, but money... ehhr... So thank you for this amazing chance! I'm using a fluid foundation by Catrice, but I'm willing to try some mineral foundation next spring! My fav product is MUFE matt velvet plus foundation. I don't have a favorite foundation, but I like Avene. Right now I'm loving FIT by Maybelline. My fav foundation is made by MAC. My favorite foundation right now is Ever Bilena Pro Flawless Foundation. My favourite foundation would have to be my airbrush foundation Luminess Air ;) SO light and airy! I don't wear foundation on a daily basis, but when I do it's Estee Lauder Double Wear Light. My favorite foundation is Pur Minerals 4-in-1! My favourite foundation is "Olay total effects moisturizer + tuoch of foundation"
I don't use foundation since i have bb cream. My favourite foundation is Second skin by Max factor. my fav foundation at the moment is Clinique Acne Solutiuons. My favorite foundation is Revlon Colorstay. Thank you! beautiful palette.